KIEV, Ukraine -- A violent scuffle erupted in Ukraine's parliament Thursday evening over a bill that would allow the use of the Russian language in courts, hospitals and other institutions in the Russian-speaking regions of the country. Lawmakers from pro-presidential and oppositional factions in the parliament session hall in Kiev, Ukraine, Thursday, May 24, 2012. A violent scuffle erupted in Ukraine's parliament over a bill that would allow the use of the Russian language in courts, hospitals and other institutions in the Russian-speaking regions of the country. The fight broke out between members of the pro-Western opposition who want to take Ukraine out of Russia's shadow and lawmakers from President Viktor Yanukovych's party, which bases its support in Ukraine's Russian-speaking east. At least one legislator, opposition lawmaker Mykola Petruk, suffered an apparent blow to the head and was taken to the hospital with blood streaming down his face. 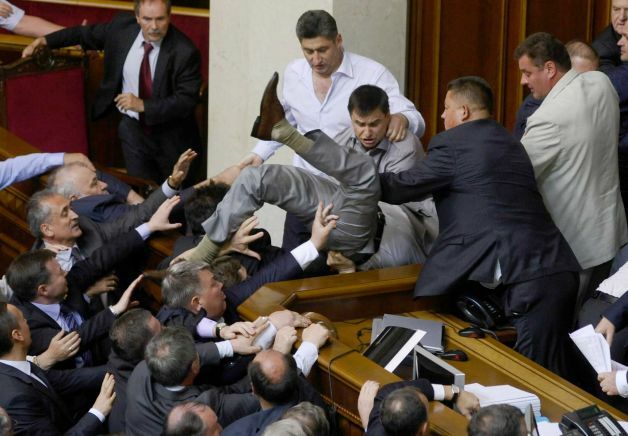 Lawmakers have frequently scuffled in the Ukrainian parliament. A fierce fight in December 2010, which sent at least six lawmakers to the hospital, started when members of Yanukovych's party threw chairs and punched opposition lawmakers who had been blocking legislative work all day. During a fight in April 2010, the parliament speaker hid behind an umbrella as opposition lawmakers threw eggs and smoke bombs to protest a naval pact with Russia. Ukraine is deeply divided into the Russian-speaking east and south, which favors close ties with Moscow, and the Ukrainian-speaking west, which wants Ukraine to join the Western club. The opposition demanded an investigation into Thursday's scuffle.